As the City of Rockhampton grew in the late 1800’s, the call for a Catholic school north of the river was heard. By 1900, North Rockhampton was a busy centre. The Fitzroy River was bridged in 1881. The meat works had been a growing business since the 1870s, despite the vagaries of the season. The railway was snaking its way north of the city towards Mackay after the Alexandra Railway Bridge was opened in 1899. The Sisters of Mercy answered the call and established a school in January 1900 in North Rockhampton. 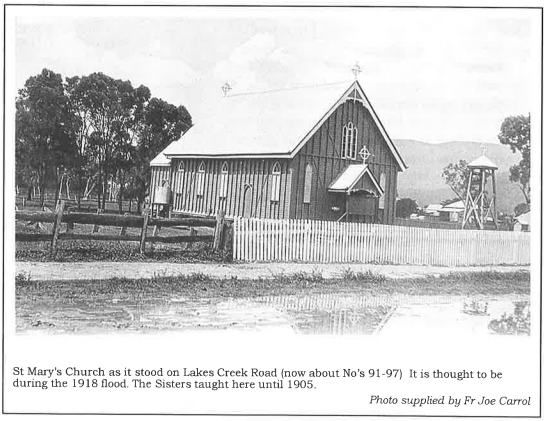 The sisters established their new school in St Mary’s Church, then on Lakes Creek Road. Three sisters led by Sister Mary Michael travelled from their Mother House at the Kent Street Convent each day by pony trap for the first few months. To avoid travelling across the river, Mr Lewis gave the sisters the use of a house near Nobbs Street. This house became the first convent. It was followed by a second larger house, again borrowed, which would be the sisters’ convent in North Rockhampton for more than half a century. 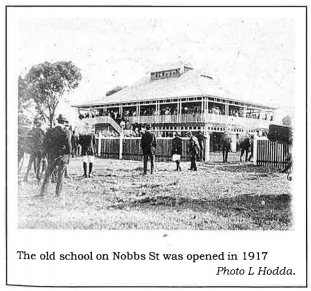 In 1905, a small school was built on Nobbs Street at what is now the Charles Street intersection. This little timber school built from second hand material was ten metres by five metres with verandahs all around. 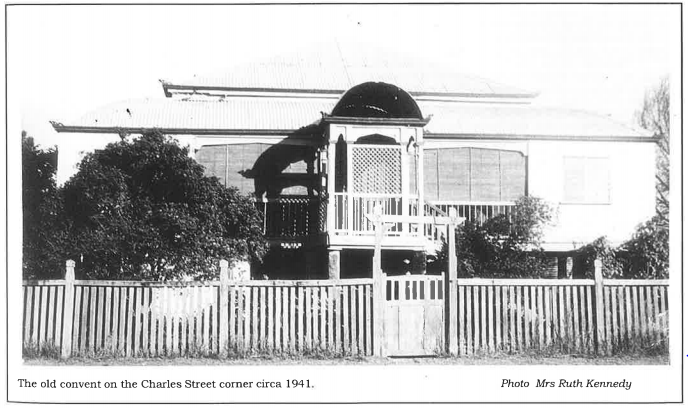 At the time it would have been a significant signal for North Rockhampton that the Sisters of Mercy were a permanent fixture in the growing community. The school was known under various names until 1921, when the name St Mary’s School became permanent in the records. Up to that time, the school was known either as St Francis’ School or North Rockhampton Roman Catholic School. In 1917 and 1918, the St Mary’s site as we know it today on Nobbs Street began to emerge from the brigalow scrub. In 1917, a large highset timber school was built on the land presently occupied by the school administration building. In 1918, St Mary’s Church was moved from Lakes Creek Road to its present location on Nobbs Street next to the school. Other significant development occurred in 1938 when the church was extended and renovated, in 1940 when the convent was built, and in 1953 when St Mary’s Hall and Infant School were constructed. More recently, additional classrooms were built in 1984, and in 1992 the Preschool building was opened. 1999 saw the construction of a new library, toilet block and refurbishments to the administration block. In 2009, St Mary’s commenced the journey towards being a two-stream school and the multi-purpose covered area (Coolock Court), four new classrooms ( Mercy Wing), a new Prep classroom and library extension were built. Many Sisters of Mercy were members of the school staff over the years and their gifts have helped many students in their lives. A Sister filled the position of Principal until 1976 when Sister Mary Patrice Kennedy finished her term and the first lay Principal, Ron Rosentreter was appointed. Today, St Mary’s Catholic Primary School offers to children from Prep to Year 7, a quality education in a modern, comfortable, caring atmosphere. We build on our past to make a future that fulfils all the promise and potential of the present.